Me at my desk. This is where I spend most of the day. The glare of the computer screen is strangely flattering. I wanted to thank everyone for all the comments on my recently Freshly Pressed blog. It really means a lot that you took the time to read it and think about it, even if you disagree. I am quite torn on the whole situation myself. But most people seemed to be encouraging, so thank you. Being compared to Hitler Youth was a new one. Hitler Youth? Just a little strong. Hopefully, we’ve determined that I am in no way Hitler Youth or like Hitler Youth or even in the same Venn Diagram as Hitler Youth, even though I was strangely attracted to Ed Norton when he was dressed as a neo-Nazi. I am just a nervous flyer. Xanax is in my future. Since my About Page is horrifically outdated, I thought I should tell you a little bit about me, so we can be friends. A terrible singer. I once decided I could scream just like Axl from Guns and Roses. This led to a very disappointing karaoke number when I realized there were actually lyrics in “Welcome to the Jungle.” I was glared off stage. A big eater. I dabble in travel writing. So I sometimes have to eat rich people’s food, like bison tartare and rabbit. (How are the rich foods also the most disgusting sounding? Sweet breads: so not what I thought). But pizza and hot dogs are the only dishes I get all snobby and ‘foodie-like’ about. Oh and poutine – the world’s best hangover cure. A Chicagoan at heart. Can’t you tell? An ex-expat. I am working on being bi- or even tri-coastal. But homebase is Seattle at the moment. I lived for most of my life in Chicago and its surrounds, then moved to Seattle, then moved to Quebec, then back to Seattle after almost a year and a half. This was supposed to be one of those expat blogs, but it’s turned into travel, humor, and the writing job-search life. I just went back to Quebec for a week by myself, as I am currently writing a travel guidebook. I returned to the West Coast eight pounds heavier. An animal lover. Prepare to see many, many pictures of my boston terrier, Elwood. A Dave Eggers Stalker McSweeney’s rejected my humorous open letters twice. Damn. C’mon Dave. I may start posting my McSweeney’s rejects on this blog, until he realizes my brillance. A French speaker. I spoke French daily for a year and a half and now I miss it. 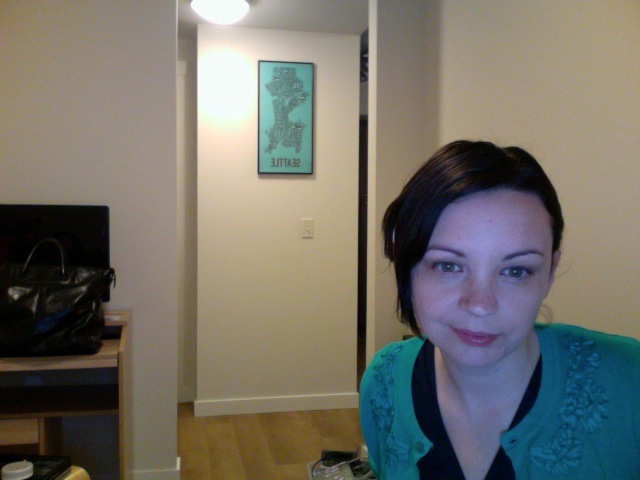 I am determined to keep it up in Seattle because it tends to impress people on job applications. (Until they actually hear me speak it and I screw up the pronunciation). Sporadically employed. After moving back to Seattle, interviewing and being rejected for a bunch of jobs, I started my own freelance studio to keep my skills fresh and income trickling in. And to keep my self-esteem intact. I can write non-funny things that sell products, funny things that draw somewhere between one person and a million to your website, and I can visit a place and uncover the best hotels, the worst restaurants. An outdated portfolio exists here. If you want me to write for you or with you, email me halmcreative[at]gmail.com. Note: there’s no “free” in that statement. A cross between Magellan and Mae West. That’s who I strive to be. Fearless, borderline reckless, and all sorts of pioneer. I never wanted the two-car garage, the bland beige house with the stone facade in the gated community. I am married (maybe this makes me seem rather dull compared to Mae West), but you get the idea: an explorer with a sense of humor. And penchant for feather boas. Categories: Facts of Life | Tags: about me, gone viral, mae west, magellan | Permalink. Well, congrats on your “Freshly Pressed” status and for not being a member of the Hitler Youth! Well done! In your new “About Me,” however, I noticed that you failed to mention your affinity for pulled pork sliders. Quite an oversight. That’s one of the reasons why I follow your blog, after all. This is true. Pulled-pork is the sole reason I can’t go back to being a vegetarian. And in slider form – omg. Add it to the list of foods I get snobby about.